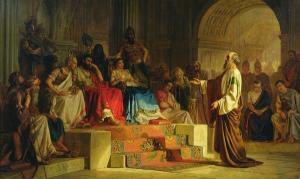 Paul on trial before Agrippa (Acts 26), as pictured by Nikolai Bodarevsky, 1875. We who are in Christ live in a great day. We have been transferred by the blood of Jesus from darkness to light. We have endless opportunities to share the love of Jesus in a time and place that needs it. We are blessed!!! Walk in that blessing today!